My mum was always knitting and reading while I was a child - she'd sit with one of my hair clips holding her pages open and would be able to knit anything this way. She made it look easy and perfectly normal. 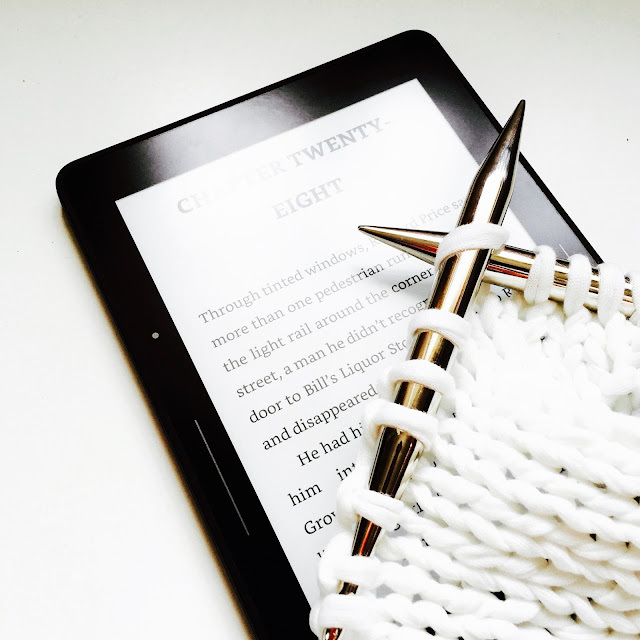 As an avid reader, learning to knit and read at the same time was nothing short of a revelation* for me and something I was determined to master - I am not nearly as good at is as Mum is, and still practicing while working on simple projects. So with my Kindle perched on my knee (or on the desk in front of me), I've been getting through quite a few novels recently. After loving 'Olive Kitteridge' I was really keen to receive a preview a copy of Elizabeth Strout's latest novel and was not at all disappointed, finishing it in a single sitting. Lucy Barton (of the title) comments "I like writers who try to tell you something truthful". On discussing an author she likes, Lucy also says "... her job as a writer of fiction was to report on the human condition, to tell us who we are and what we think and what we do". This is exactly what Strout does within the pages of this novel. Strout is a master storyteller with a remarkable ability to describe simple everyday moments using plain uncomplicated language, while managing to perfectly capture so much of the complexity and nuance they contain. Her (quite everyday) tales feel so honest and authentic that it is entirely possible to forget they are, in fact, fictitious. This short (208 page) novel tells the story of a difficult 'mother-daughter' relationship. The protagonist - Lucy Barton - is a successful writer, looking back on a period of five days that took place in the mid-80s when she was hospitalised, and visited by her mother. The tale unfolds via a series of expertly crafted anecdotes - both Lucy's own recollections, and stories her mother shared during her visit. I feel that to say much more about the story or the characters would be to deprive you of discovery, but suffice to say I found it thoroughly engaging. This is the expertly crafted story of indie film director Sophie Stark, as told by various people in her life. This device might easily have felt clumsy, but North handles the different narratives perfectly, leaving the reader with an interesting array of perspectives, and many unanswered questions. While I'd like to write pages of my own conjecture on Sophie's character and motivations I don't want to say any more which might spoil the journey for someone else. It is rare that a book lives up to the hype, but in my opinion this one is worthy of the rave reviews - although it would be better to read those after the book as some are very detailed. I really didn't want to put it down and have been recommending it to my friends. Not normally one for spy novels, and with no prior knowledge of the author I wasn't sure what to expect, but am so glad this caught my eye as I was drawn in from the first sitting and looked for any excuse to read it! Although it is a novel about spies, set at the height of cold-war paranoia, very little really happens during that period. The majority of the characterisation and drama occurs via seamless flashbacks to the previous lives of the main characters - Lilly (Lili) a German-Jewish immigrant now nationalised and teaching at the local school in Muswell Hill, her husband Simon who works for the Admiralty (thanks to the old-boy network) and Giles, a spy and Simon's former "friend" from Cambridge. The 'exposure' of the title - the threat of exposure - is a theme which runs flawlessly throughout and which works on different levels. The real skill of the author is that she manages to maintain suspense and interest in a book which has very little action or plot by producing characters that are both memorable and sympathetic (even Giles, who probably shouldn't be). I really enjoyed this book and would certainly like to read more from the author. This has had a lot of publicity and was the first book I'd read by this author. Overall I felt it was well written - the premise was pretty good, gripping me from the start, and it continued at a good pace, thanks to the short chapters. So why only three stars? Well, the main character seemed a bit of a cliché and overall the resolution a little flat and predictable. It didn't really have much of a 'twist' and so I found myself rushing the end to get through it, rather than to discover who the killer was. (The section where the killer was described as 'the figure' also felt a little clumsy and unnecessary.) I would consider this a 'holiday' novel - relatively quick and readable, but not especially memorable. Have you read any of these? If so, what did you think of them? If you use Goodreads, and share my taste in books, you will find my profile here, feel free to add me as a friend so I can see what you're reading and reviewing. *A few people have asked about the mechanics of this when I've mentioned it so here are the details. I prefer to use a Kindle device - a quick tap of the screen will advance the text and there are no pages to get the yarn tangled with. My preferred device is a Kindle Voyage but I'll use a Kindle Fire when working on something more tricky - that has the option to listen and read at the same time as many of my books are from Kindle Unlimited and include audio. If not, many ebooks have text-to-speech, which is a bit like being read to by a satnav, but as you can follow along on the screen (and it turns over for you) it's a very handy way to multitask. I cannot manage to read and knit at the same time, at all. But I often knit while having a tv-show playing on my tablet, and I am very good with listening while knitting. So podcasts and audiobooks are my go to for crafty multitasking.